The mid 2017 Apple 21.5" iMac measures at just 5mm at its edges, and its widescreen display features LED backlighting for vibrant and accurate support for millions of colors. 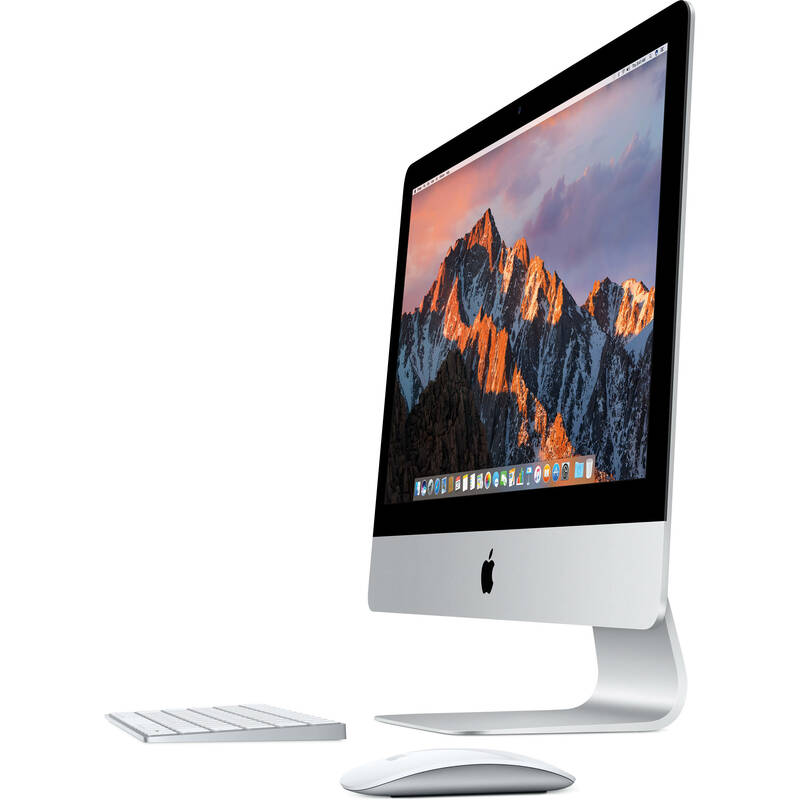 With in-plane switching (IPS) technology, the iMac has a wide viewing angle. The screen has a 16:9 aspect ratio and a Full HD 1920 x 1080 screen resolution, supported by integrated Intel Iris Plus Graphics 640. The iMac's processor has been upgraded and now houses a 7th-gen Kaby Lake 2.3 GHz Intel Core i5 Dual-Core processor that can be overclocked up to 3.6 GHz, as well as 8GB of 2133 MHz DDR4 RAM. Visuals are powered by the integrated Intel Iris Plus Graphics 640 chipset, and for storage, there is a 1TB 5400 rpm hard drive. Apple's 21.5" iMac (Mid 2017) operates using 100-240 VAC at 50-60 Hz and includes an Apple Magic Keyboard, an Apple Magic Mouse 2, a Lightning to USB cable, and a power cord. Protection is provided by a limited 1-year warranty, which can be extended using AppleCare. Whether your iMac is in your studio, living room, or kitchen, the display is the focal point. With a 1920 x 1080 screen resolution and a 16:9 aspect ratio, you'll be able to playback Full HD 1080p content natively. The IPS panel allows for wider viewing angles so more people can enjoy the display without having to crowd around it. With integrated Intel Iris Plus Graphics 640, the iMac delivers Full HD visual effects and 3D graphics, as well as the ability to edit 360° video and create 3D VR content. The iMac houses a 7th-Gen Kaby Lake Intel Core i5 Dual-Core processor that can reach a stock speed of 2.3 GHz. It can also be overclocked up to 3.6 GHz, thanks to Intel Turbo Boost 2.0 technology. The 7th-gen Kaby Lake Intel processor uses low voltage for better energy efficiency while still providing fast performance needed to run processor-intensive applications such as Logic Pro or Final Cut Pro. Combined with 8GB of 2133 MHz DDR4 onboard RAM, the iMac allows you to multitask quickly and efficiently. Box Dimensions (LxWxH) 26.0 x 21.5 x 9.0"
21.5" iMac (Mid 2017) is rated 4.7 out of 5 by 36. Rated 5 out of 5 by Ally from It's an iMac...What's Not to Like? Our old iMac finally failed, and it was time for a replacement. The new iMac is the same size, but with more power, more storage, and more connectivity options. Setup was easy. Turn it on, plug in the back up drive, and everything happens. The only glitch was that the wireless keyboard and mouse wouldn't connect when first starting it. I used the old wired keyboard and mouse to get the computer started, and once setup was completed I turned on Bluetooth, and the new wireless peripherals worked. Love my iMac. I also loved the price buying through B&H. The delivery was free and it arrived exactly on schedule. Rated 3 out of 5 by Folmsbee from Not powerful enough for Adobe Premiere I was warned by a colleague but didn't want to spend the money for a more powerful processor, reasoning that I wasn't going to be doing a lot of graphics or other demanding tasks when editing on Premiere . . . but it is very sluggish with this software. Need to re-boot every few hours, when it gets super slow. I'm getting by with it but would strongly recommend buying the more expensive iMac with more processing power for any kind of editing. Also, the mouse seems unresponsive a lot of the time. I charge it (with the terribly designed special cable/port -- you can't use the mouse while it is charging) but it isn't as responsive as my old mouse, which I use instead. Rated 5 out of 5 by Hosking from 2017 21.5 inch Imac I replaced my aging 2009 iMac with this 2.3 iMac. I wouldn't have replaced my old one as it was running fine, but no longer supported by Apple and programs I used would not run on it anymore, so I had to buy one. I don't think it is a whole lot faster, as I had put in 8 gb of ram into matching this one. Maybe the higher end retina models or ones with fusion drives would be faster, but for my needs this one is fine. The display though is awesome compared to my old one. And B&H had the best price, even better than Apple refurbished with no sales tax and free shipping. It arrived fast and just as I expected. Brand new. Couldn't be happier. Rated 5 out of 5 by Fred from Clearly a winner in my book I needed to replace my 2008 Mac Desk Pro. After looking over my options, the new Mac Desk Pro models were just a little to costly for my use, the Imacs seemed to fill the bill. I though about the 27" one, but it would not fit into my spot. I was worried about the small screen size of the 21.5" and my aging eyes, but it's worked out well. Highly recommend this model. Rated 5 out of 5 by Sebastian from Apple 21.5" iMac It's been nine years since purchasing my last iMac. There have been so many changes including OS and security updates, peripheral upgrades and audio/visual enhancements. The computer is definitely lighter in weight due to the absence of an internal optical drive. I look forward to learning about the new software and upgrading to the latest graphic design applications on the market. This model is not the one with retina display as I do not need it for gaming or extreme design precision. I believe that for every computer upgrade (even at the base model), its technology has got to be more superior than the model I previously owned. Choosing a Mac is the best decision you'll ever make as an aspiring designer. Rated 5 out of 5 by Larry from easy setup with Time Machine and iCloud Even iMacs get old. Our old and currently my wife's 11 year old iMac was terminal, but she couldn't stand the idea of CHANGE. Finally she allowed me to get her a new base level iMac. Shopping was easy via the internet with B&H having the best price (with no tax and free shipping). It arrived on time and setup was very easy thanks to having used Time Machine and iCloud. My wife is pleasantly surprised with its similarity to the old iMac. She did insist in keeping the old keyboard and 3rd party wireless mouse. No problems with the setup. Now I have a spare keyboard and mouse. Things are working out well except my old iPad is having problems. Her newer iPad is doing well. We are happy Apple users since 1982. Thank you Apple and B&H. Rated 5 out of 5 by Daquonious from G - good enough for me. Everything you need.? Nothing you don't.? Good price for an iMac if you don't need the extras and don't want to buy used.? B&H shipped promptly and it arrived in perfect condition. We do not offer a payment plan, however we do accept PayPal Credit, and this is offered as a payment method when you check out. Does product arrive in discrete packaging? Yes, we do not just ship this in just the Apple box. It is shipped in a larger &quot;brown&quot; box. The warranty is not included in the final price? I Need to buy the Apple care to get the warranty? All Apple computers come with 90 days of telephone support as well a 1 year warranty for manufacturer defects. If you purchase Applecare+ on the computer, it extends the warranty and phone support to 3 years and also adds 2 incidents of accidental damage coverage as well (with deductible). Can this computer connect to the internet wirelessly? is the Mid 2017 faster than the older versions of the 21.5? This is my first Apple iMac so I can't really answer your question, but I think it is pretty fast. Can I burn CD&rsquo;s with this or is that a printer question? No there is no on board disc drive. I use an external disc drive to burn CDs.